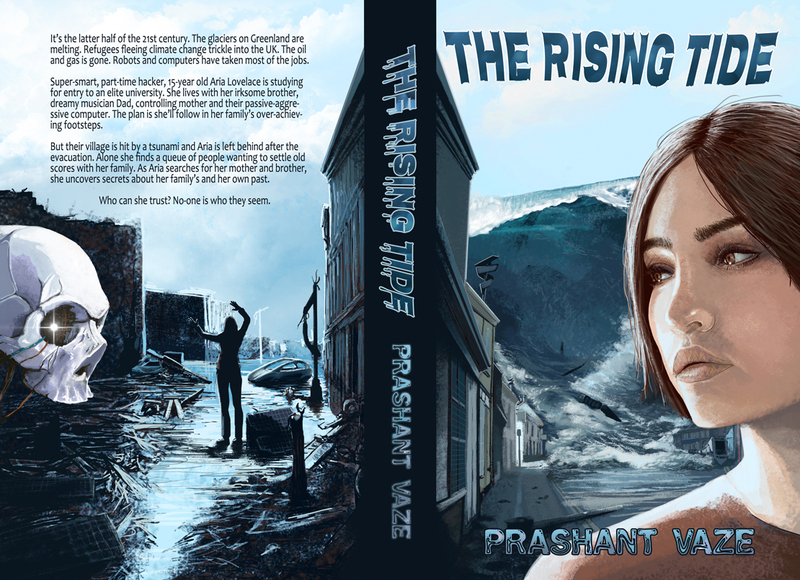 Full wrap book cover I created for Prashant Vaze’s debut fiction release ‘The Rising Tide’. If you like the sound of a thought-provoking science-fiction novel about the impact of climate change this will be well worth checking out. Due for release December 15th and available for pre-order for Amazon Kindle and in paperback. Read the first two chapters for free at http://prashantvaze.com/. It’s the latter half of the 21st century. The glaciers on Greenland are melting. Refugees fleeing climate change trickle into the UK. No more oil and gas; robots and computers have taken most of the jobs. Their village is hit by a tsunami and Aria is left behind after her village is evacuated. Alone she finds a queue of people wanting to settle old scores with her family. As Aria searches for her mother and brother, she uncovers secrets about her family’s and her own past. No-one is who they seem. Who Can she trust?